Microsoft recently made a series of announcements around Microsoft 365, its product that combines Windows 10, Office 365 and Enterprise Mobility + Security. The Redmond firm also unveiled new features for Office 365 ProPlus such as the arrival of Microsoft Teams in the application suite. Organizations that choose to install Office 365 ProPlus will now find the Teams collaboration and messaging solution in the Microsoft application suite. For many months now, the firm has been communicating extensively about Teams. Let's not forget that the software is destined to replace Skype Business. It is therefore not surprising that Microsoft integrates it into its Office 365 ProPlus product to ease the transition of users. As a reminder, Teams includes many features: chat, calls, videoconferencing, file transfers, etc. 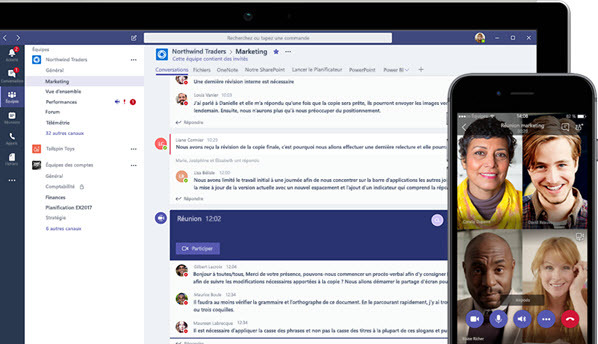 Read also: the Microsoft Teams corporate chat application is becoming a must. In 2018, Microsoft made the program available in a free version to accelerate the product's adoption by companies and prepare the offensive against its competitor Slack. The other thing to remember is that Office 365 ProPlus will now be in 64 bits by default on Windows. No more 32-bit versions of applications. An upgrade tool will be offered to companies. It will allow them to switch to 64-bit Office without having to uninstall and reinstall it manually. The deployment of these new tools and features will begin this month.